Makowiec (pronounced "Ma-KOH-viets") isn't, strictly speaking, a holiday bread. 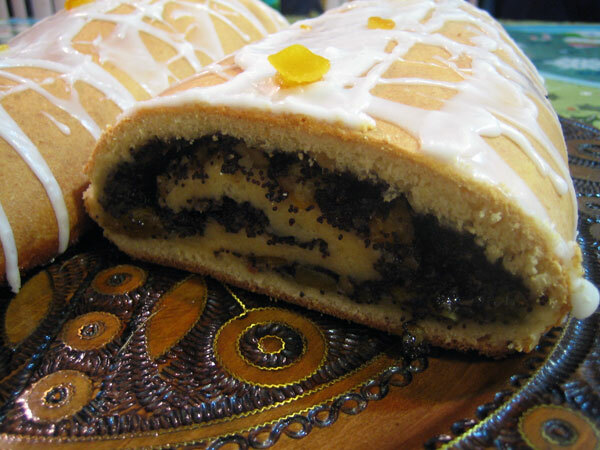 But it is a classic Polish dessert or tea bread that is commonly served around the holidays. And it is delicious. Almost all of the moisture in this dough comes from the sour cream, butter, and eggs. There is no primary fermentation: it is one rise and in the oven. This suprised me enough that I verified the recipe in 3 different Polish cookbooks. All of them used this same technique. 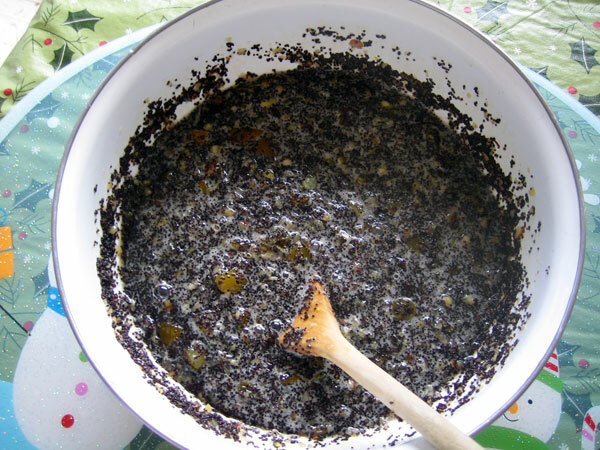 To prepare the filling: Put poppy seeds in a small saucepan. Cover with water and bring to a boil. Remove from heat and let stand until cool. Strain the poppy seeds through a fine strainer. Combine the poppy seeds, walnuts, and almonds in a blender or food processor and grind. Melt the butter in a skillet. Add the poppy seed mixture and sugar to the skiller and simmer over low heat for 10 to 15 minutes. Stir in the egg, honey, orange peel, lemon peel, and raisins. Whip the egg whites until stiff and then folk into the poppy seed mixture. Let cool. To make the dough: Prime the yeast in the warm water. Cut the butter into the flour until the mixture resembles course crumbs. Mix in the salt, and sugar, then mix in the yeast, eggs, egg yolks, sour cream, vanilla extract, and lemon rind. Once the ingredients are mixed and can form a ball of dough, turn out onto a work surface and knead for 8-10 minutes (or use a stand mixer to knead for 5-8 minutes) until the dough is smooth and satiny. 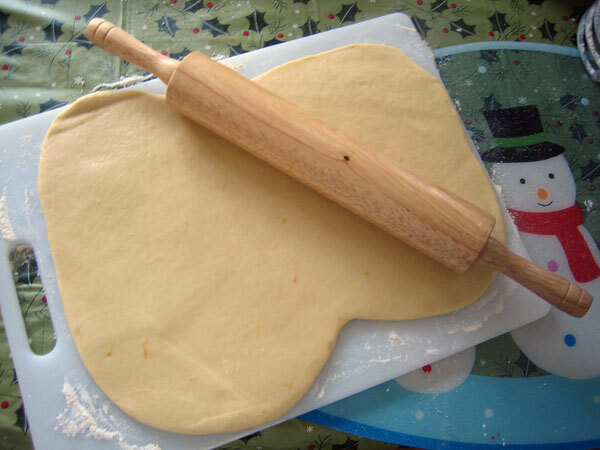 To make the rolls: Divide the dough in two. Roll out each piece into a thin, roughly square shape. 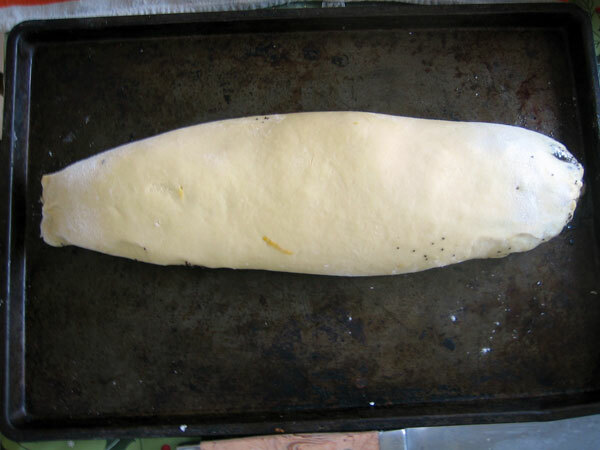 Spread half of the filling onto each piece and then roll the dough up, sealing the seam and ends as tightly as you can. Place each roll onto a baking sheet. Cover with a damp towel or place the baking sheets into plastic garbage bags and set aside to rise for approximately 90 minutes. Bake in an oven heated to 350 for 30-35 minutes, until the exterior is golden brown. Allow to cool for at least 15 minutes then glaze. Beautiful! And it looks tasty! The filling looks soo good. 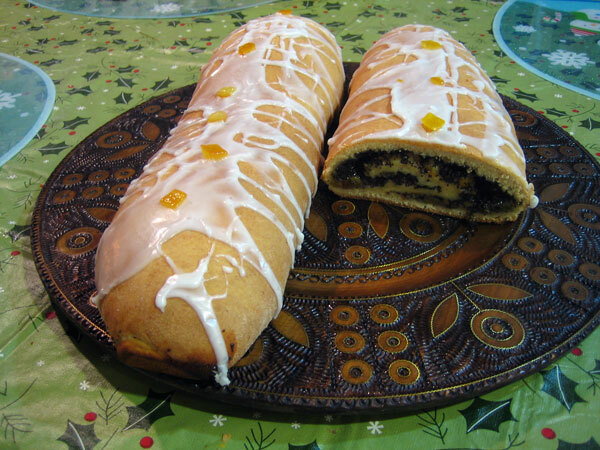 I love making traditional breads like this for christmas, I'll have to try the stollen this year, as it's been a while. I enjoy both their poppyseed and walnut versions, which are the old traditional types. In looking at their website today, it appears that they have expanded their product line. In addition to thinner dough, the other tendency with politica over Beigli is it tends to separate the eggs, and use he whites in the filing. Thy also tend to use a wetter dough and bake lng rolls of it in loaf pans. of poppy seeds..WOW. Is there anywhere around here that I can purchase in bulk at a reasonable price? It looks very, very good. If you have a Russian, Polish, or other Slavic market in your area, they usually have poppy seeds available by the pound. That is where I got them. Floyd, have you found any Slavic markets locally in the lower mainland? I haven't yet, but I haven't really looked yet either. I'll let you know if I find anything. We caught the Polish dance troupe at the Vancouver Christmas Market last weekend and heard quite a few Polish speakers, which is a good sign. Maybe you are already familiar with them, but Penzeys Spices sells poppy seeds for $6.80 a pound both online and in their stores. So far they are the most reasonable I have found. I'm not sure where you live, but they have 36 stores nationwide. Their website is www.penzeysspices.com. I have been using their spices for several years (since I was a kid, really), and I loved them so much I decided to work their a few days a week! Their vanilla extract is superb, as well. A friend of mine is convinced that their cocoa powder is the best available (especially for the price!) since it does not clump when sifted like Hersheys and others tend to do. I forgot to mention -- they will also grind them for you if you don't have a grinder or don't want to put up with the mess it can be. I can't remember the exact price - you have to call them to find it out since it is not on their website, but I believe it is around $9.00 a pound. Anyway, that's my plug. I love the place! I like that they will grind them for you..I'm going to check it out. Thanks again! it's a very important - before purchasing to check s poppyseeds freshness. Are the haven't smell and taste of rancid fat. 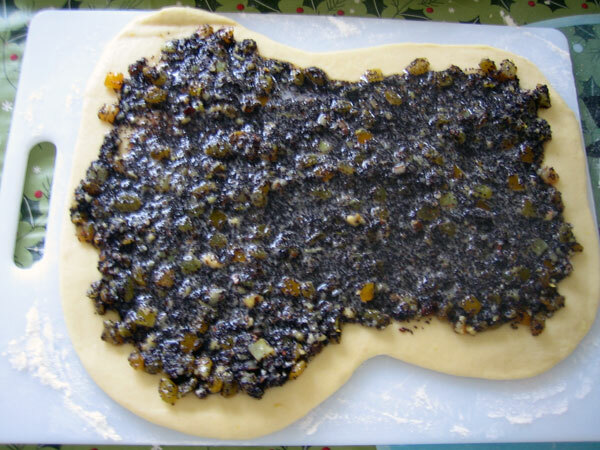 Poppyseeds fat quickly exposed to rancidification. Am really curious about this recipe, but a bit hesitant to use such a large amount of poppy seeds. Has the filling got a gritty texture and what flavour do the poppy seeds contribute in that quantity? The loaf/log looks very tempting. Floydm, what did your chief taster think of it (what is his name)? There are plenty of places to order them online. Maxamillian Kolbe suggests Penzey's Spices, and I see many other sellers through Amazon. I've been to Oświęcim and am familiar with the story of Maxamillian Kolbe, but if you look up the thread you'll see that there was a user here named maxamilliankolbe. I've had my champion juicer for over 30 yrs. and it still works great..never thought about grinding poppy seeds in it. A hotel I once worked in years ago made the best poppy seed braided roll I have ever had..everyone loved it...I wish I had the recipe. I keep sayiing I will try to duplicate it one of these days! This brings back some memories! Your poppy seed roll looks delicious. I used and changed a litlle the recipe from http://mimicooks.wordpress.com/2009/08/20/destructive-desire/ . Oh, and I was never a fan of this as a child but in my later teen years before she passed away, I learned to love it. What I would do for a slice now. I've been compiling recipes for this pastry (makowiec aka beigli, aka povitica) and there are a zillion different recipes. I've noticed the Polish versions use icing. The Hungarian versions tend to add sour cream (though yours does too). BTW, you can grind the poppy seeds several tablespoons at a time with a spice grinder. A non-traditional flavoring I found works well with this is orange water. Although I was born in the United States, my family is of Polish origin and my grandmother prepared this dessert and it was exquisite... what beautiful memories of when I was a child!